If BMI had its way, every ripped gym rat would be called obese. You know the body mass index drill; the old height and weight calculation that tells one if they’re healthy or not, just-right or obese, at risk for heart disease and diabetes or fit as a fiddle. The problem is, since BMI only calculates a healthy body based on that simple formula, and well, a pound is a pound be it fat or muscle, that metric can be very deceptive, especially for the uber fit. But body composition, ah, now that’s another story. While not as easy to determine, body comp is a measure of how much of one’s weight is made up of lean mass – muscle, bone, tissue and water — versus fat. It is at once a more accurate, and complex, analysis of a healthy body. One way is to literally do the math: 1/Db = w/Dw + f/Df + p/Dp + m/Dm. If you can answer this equation, or at the very least explain it, go to the head of the class. For the rest of us, basically everyone, there’s hope because there are myriad ways to determine body composition. From air or water displacement total body imaging, ultrasounds, skin folds or even the good old tape measure method. 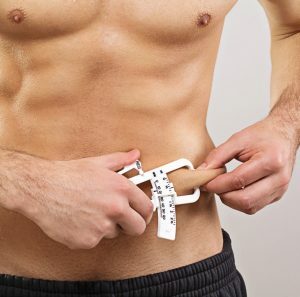 One way to determine body composition is though Bioelectrical Impedance Analysis (BIA). In this process, a painless electrical current is sent through one’s body on a BIA machine or scale. The rate that current travels through the body is used to calculate the amount of fat-free mass and percentage of actual body fat. There’s a far more complicated definition, but that’s the gist. And many trainers and nutritionists employ that data rather than simply BMI when helping clients. If you ask personal trainer, sport nutritionist and GYM SRQ staffer Cody Pleszewski, he’ll tell you that knowing a client’s body comp is an important tool when he’s advising on nutrition. Especially when gathered from BIA. At Complete Nutrition, owner Jeff Bueth says, they use the state-of-the-art InBody BIA machine to determine body comp. InBody was founded in the mid-1990s by a Harvard Medical School-trained physician. The InBody machine at Complete Nutrition uses Direct Segmental Multi-Frequency BIA with an Eight-Point Tactile Electrode Method to accurately measure body compositions, according to the InBody website. Jeff says, “We set you up for success,” by providing the correct meal plan based on body composition. Ever been to a carnival or charity event or kid’s party with a dunk tank? We’re talking the total body water (TBW), also known as the dunk tank method of gauging body comp. Actually called a hydrostatic tank, this method takes about 10 minutes and following that dunking, you get a detailed report that shows fat and fat-free body mass, as percentages and in actual weight, how much fat, if any, you need to lose to achieve your desired body composition, how many calories per day you burn without exercising or how many you burn from different exercises and, tells you what’s your ideal body fat based on age and gender. “This makes tracking body composition trends with the hydro-static method over time very easy and accurate,” he says. The mobile BodyFatTest ‘dunk tank’ will visit Sarasota for hydrostatic body composition testing at Real Fitness on Nov. 11. For more information on body composition analyses and nutrition, visit CompleteNutrition.com, GymSrq.com or BodyFatTest.com.